Guys, it’s officially the first day of fall today. We’re having some conflicted feelings about this. It’s bittersweet, this official fall declaration because this means your swimwear won’t be so readily accessible. But, on the plus side, this does mean that all off your resortwear favorites will move to the front of your closet. So, I guess you can say we’re just swapping some summer favorites for fall favorites, right? We’ve come up with a comprehensive list of all things fall. Everything that makes us happy to transition into cooler nights and autumn leaves. We’re talking pumpkins, graphic tees layered with sweaters, and scarves galore. Have you checked out our Scarf Season blog? It’s pretty rad and we recommend it before reading further. But now, without further ado, here is our list of Fall Favorites for 2015. We’ve said it before and we’ll say it again, transition your summer wardrobe to fall must include your resortwear pieces. We’re talking about those long maxi dresses that are hanging in your closet. But ’em out for the next few months and throw a sweater over it. That Bohemian Bones Raspberry Maxi Dress? Keep it until November and throw a leather jacket over this bad boy. Or what about our latest Lovers + Friends clothing? Pairing a light jean jacket with the Smokin’ Hot dress makes for one smoking hot outfit. Heat up the streets without having to leave those beautiful resortwear pieces behind. We love us some sweater weather. Heck, any type of jacket weather is alright in my book. Since living it Miami, being able to wear a jacket, leather or otherwise, is a rarity, so when it happens we go all out. But isn’t it great when the crisper air rolls in, and you can throw on an oversized sweater and sit drinking coffee at an outdoor cafe and not worry about a dang thing? Sounds lovely to us. Cooler nights bring warmer feelings in my book. CHEAPER GAS, PEOPLE! You may not know this……but when the colder months roll around, you also get cheaper prices for gas. Notice lately how your local gas stations have been knocking some cents off those signs? The temperature drop means that oil companies can switch to their winter blend which is less expensive, because they do not have to put in those extra additives which keep the gasoline from evaporating as quickly in hot weather. Simpler explanation, but no complaints on our end. Save some $$ for those Pumpkin Spice Lattes. We love The Laundry Room. They are born, bred, and bleeding California, and they’ve been making chic, cheeky apparel for years now. Designed by “The Pauline Brothers” and friends, The Laundry Room is a collection of new and reconstructed vintage clothing and goods that both accommodates the market and inspires the market by pioneering fresh and innovative ideas like their breakthrough debut signature process of applying “precision prints” to hand crafted denim & cutoffs that are entirely “made better in California,” as read on any of their vintage reconstructed styles. Check out some of our favorites that I must say, would look phenomenal under a jean jacket or a thick, cardigan. You know what we love? Food. We do. And the highlight of our autumn months sometimes is based strictly on the fact that certain foods are more readily available than say, during summer months. Like pumpkins. 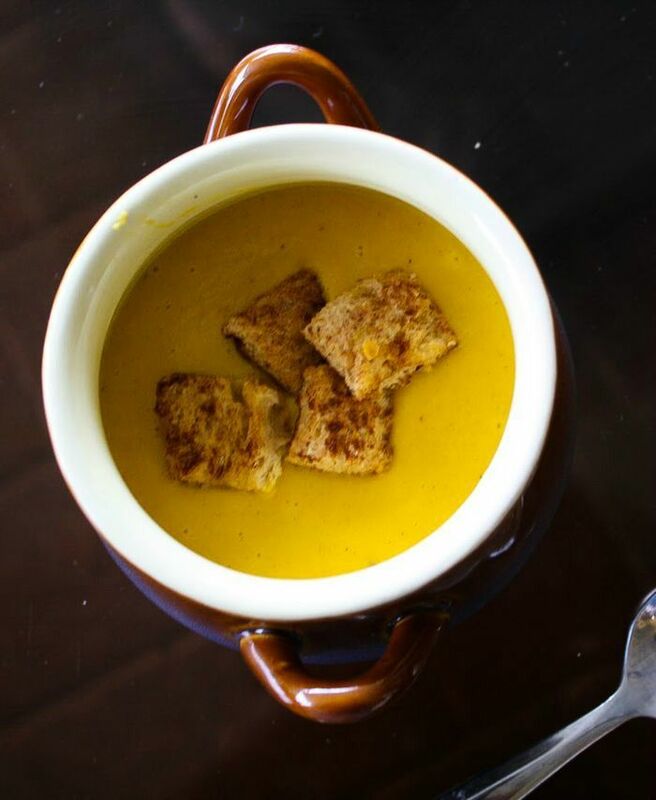 We know everyone is sick of hearing about pumpkin-everything, but you know what, you can’t hate on this recipe below for a KILLER pumpkin soup. Like, probably one of the best soups you’ve ever had. EVER. Know why? Because inside the creamy, delicious, pumpkin-y soup you float some brown sugar crusted breadcrumbs. I probably just ruined your day. Or your mouth is watering. You’re welcome for dinner tonight. 1. Preheat oven to 400 degrees F (200 degrees C). Combine butter, brown sugar, and cinnamon. Spread butter mixture evenly over one side of each bread slice. Place bread, buttered side up, on a baking sheet. Bake 8 to 10 minutes, or until bread is crisp and topping is bubbly. Cut each slice of bread into 8 small triangles or squares. 2. Saute onion in butter in a medium saucepan until tender. Add 1 can chicken broth; stir well. Bring to a boil; cover, reduce heat, and simmer 15 minutes. 3. Transfer broth mixture into the container of a blender or processor. Process until smooth. 4. Return mixture to saucepan. Add remaining can of broth, pumpkin, salt, ground cinnamon, ground ginger, and ground pepper; stir well. Bring to a boil; cover, reduce heat, and simmer 10 minutes, stirring occasionally..
5. Stir in whipping cream and heat through. Do not boil. Ladle into individual soup bowls. Top each serving with Cinnamon Croutons. Okay, so we know that everyone is super stoked over Halloween, Thanksgiving, and Christmas, but you forget one of the greatest holidays of all. CYBER MONDAY. Avoid the lines, waiting outside, and camping in tents on sidewalks. Instead, spend Thanksgiving with your loved ones then laaaaater when you’ve had your fill of the holiday weekend, hop online and shop our BIGGEST sale of the year. Biggest and best. Huge savings on brand new 2015 items. Did you see that 2015 Beach Bunny swimwear monokini that is to-die? Yep, Cyber Monday keeps some cash in your pocket and leaves you in some stylish 2015 designer duds. These are just a few of our favorite things. What are you most looking forward to this fall season?